BOOK OF HOURS -A manuscript leaf from a book of hours, on vellum. BOOK OF HOURS - A manuscript leaf from a book of hours, on vellum. Title : A manuscript leaf from a book of hours, on vellum.. Date : Flanders, ca. 1480. Size : 7.5 x 5.4 inches. / 19.0 x 13.8 cm. Description :20 lines of text in an ornate batarde hand in brown and red ink. RECTO: four 2-line illuminated initials in burnished gold with blue, pink and white infilling, three 1-line initials and line filler in same. Parts of text in red ink. 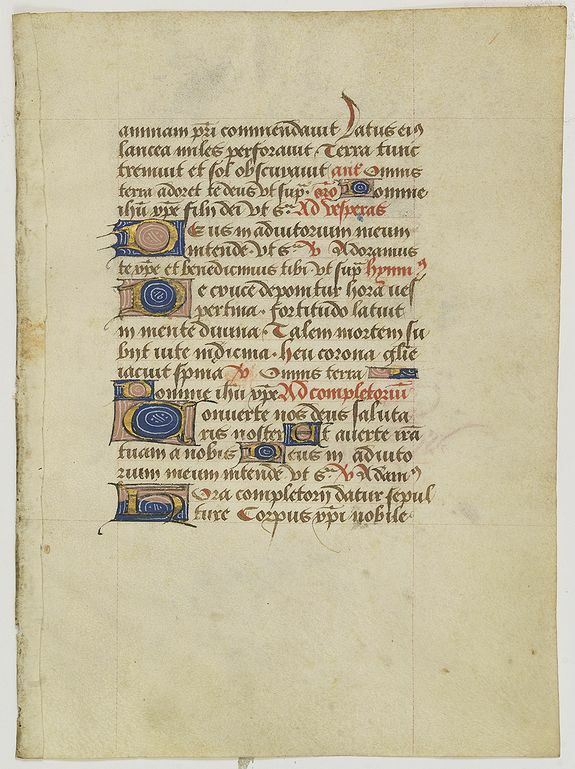 VERSO: 10 lines of text, and halfway the page an elaborate line of text in red, announcing the end of the Holy Ghost hours. The script is unusual and the scriptor seems to have been in an enthusiastic mood. Condition : This large leaf looks rather unusual, is in good condition, and has wide original margins. Flat vellum. The verso has stains at top and bottom of the page, just touching the text at top. This though is not visible on the recto. Otherwise the leaf is fine.